Bibby Financial Services (BFS) have launched pre-shipment trade finance to support UK importers needing to pay overseas suppliers in advance of goods being manufactured and shipped. Traditionally, trade finance is only available to pay overseas suppliers, once the goods have been shipped. It them provides the importer with the opportunity to sell on the shipment of goods, in order to repay the finance. In many cases, importers use a factoring arrangement to both collect the invoices to debtors and repay the trade finance with further prepayments. This new service from Bibby accelerates the funding cycle by allowing importers to access this type of finance much earlier in the manufacturing cycle. This improves cash flow and can enable UK importers to negotiate lucrative supplier discounts, in return for preshipment payments. This change from the traditional funding model has been made in the light of changes to supply-chain relationships, in the wake of the Brexit referendum. If you would like more information about trade financing generally, we have more specialist trade finance information on our website. Alternatively, please call Sean on 03330 113622 to discuss your requirements. 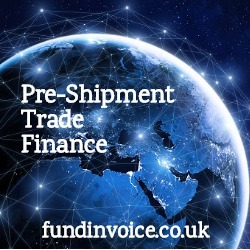 You can use the link at the top of this post to contact our funding partners, Bibby Financial Services, directly about their pre-shipment trade finance.